If you’re an entrepreneur, you’ve probably heard that a good pitch is important. According to the authors at PitchSkills, the quality of your pitch is at least as important as the quality of your business plan. 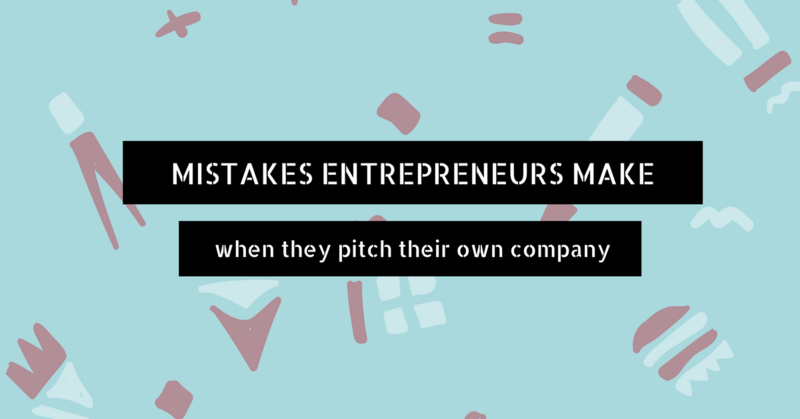 In this article you can find the 10 most common mistakes entrepreneurs make when they pitch their company. This is a summary from the full article: 30 mistakes you should avoid when you pitch your company to an investor. In general it’s better to have your pitch a little bit too short, than a little bit too long. After you’re done pitching there will be time for questions and answers. This is where you can get into details. The first goal of your pitch shouldn’t be to explain everything. Your first pitch should be about making the listener excited. When you are pitching your company, you want people to think that you care about the subject. Right? If you keep your hands in your pockets, this comes across as uninterested and makes you look bad. If you want your listener to understand what you say, you should give him time to digest your words. A well timed pause is one of the most effective methods to improve the quality of a pitch. Unless you are pitching to the number one industry expert, you should avoid using industry jargon. You might be familiar with your industry’s terminology, your listener likely isn’t. Some entrepreneurs think it makes them seem like experts if they use industry jargon. Unfortunately for them that’s not the case. It makes you look silly and it will drive your listener elsewhere. It’s a good thing that you planned out everything for your company and that you’re very excited for it. Bravo! However, that doesn’t mean your listener cares about every single detail of your company. Pitching the basic building blocks of your company is more effective and yields better results than discussing it from a to z. Too often you see entrepreneurs struggling to get their words out. Not only does this make you look unprepared, it also gives the impression that you aren’t confident about your company. To deliver your pitch with flair, you should practice it at least 50 times. A frequently asked question after you pitched is ‘who are your competitors?’. Whenever this questions arises you should have a list of competitors ready in your head. Additionally, you should be able to explain why you are different and how you are better than the competition. Let’s say you just did an amazing pitch and your listener got truly excited about your company or project. This is the time to ask your listener for a favor. This could be anything, ranging from: * We are looking for an investment of 250k to invest in marketing. * We are looking for a new partner for our sales channel. Shall we meet for coffee tomorrow? Depending on what you’re looking for your call to action can be many things.